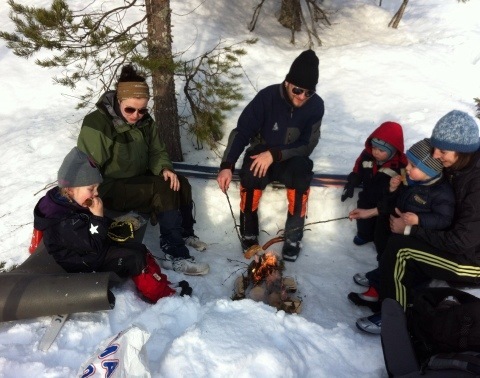 Our first skitur (ski outing) of the season – with neghbours Kvammen/Hanssen. Gorgeous day, perfect conditions, and hot dog grilling. 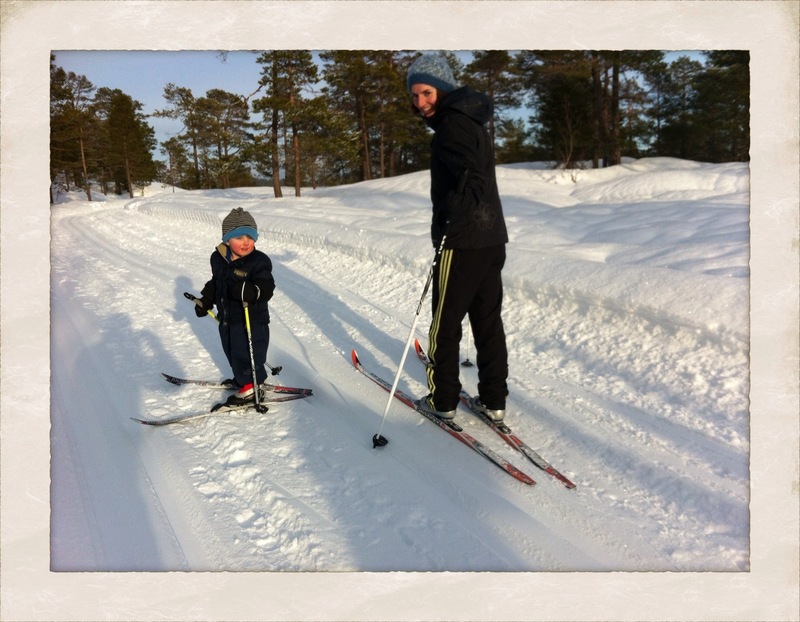 This was Karel’s first ever skitur skiing completely on his own. He didn’t stop once. Very impressive! We are very proud. The silly lady eats chocolate rolls. Let’s see. Bjørn is out of town. Not just out of town, but in Paris. France. Surely spending the moments between delicious-food-consumption and delicious-wine-consumption wishing his beloved wife was with him to join in food-and-wine-consumption. ANYWAY, the point is that we had a busy day, and he’s gone, and the DVD I want to watch now that the boys are finally in bed is no where to be found, which is making me crazy, and my second choice of DVD for unknown reasons will not work, and despite being insanely tired earlier today, I know that if I do not TALK TO SOMEONE and purge all this stuff in my head I will not be able to sleep. Karel. Can I talk about Karel for a minute? I am barely keeping my nose above water when it comes to Karel. He’s smart, and he’s 3. A lethal combination. I feel like I actually DO need to explain and rationalize my parental decisions to him. 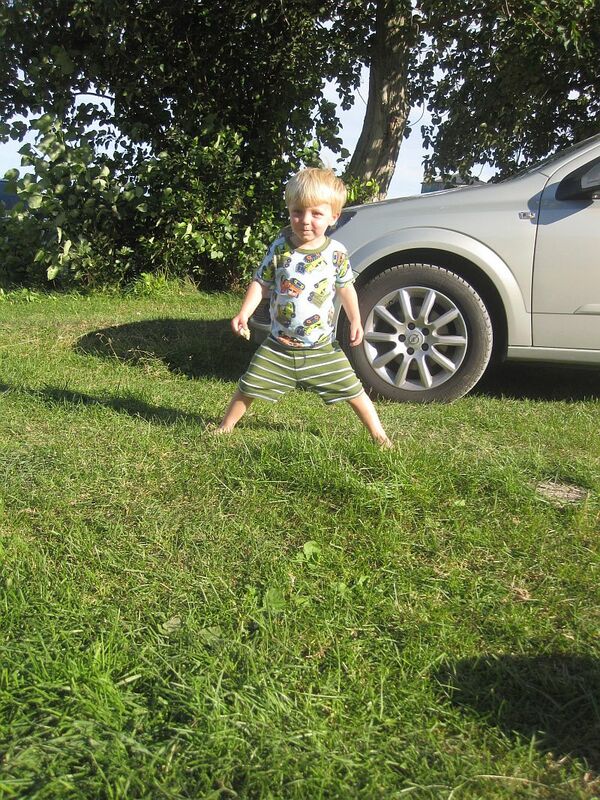 Then I remember that I gave birth to this particular child and couldn’t walk normally for weeks afterwards, and therefore I am fully entitled to use ”Because I said so.” Liberating. Anyway, the problem is that at all too young of an age he has discovered how to use his cuteness and vocabulary to diffuse a situation in which he’s getting in trouble. For example: Karel thinks it’s hilarious to blow bubbles into his water cup during dinner, despite being told repeatedly to stop. So I took it away. The elicited response? ”What are you doing, you silly lady?” with a look of true indignation. I tried really, really hard not to laugh, and almost succeeded. Tension broken: 1 point Karel. Then there’s the picking up the toys scenario, to which I fully admit surrender. Another point to Karel, hands down. Toys can’t be just picked up and put away. They have to be played away. And 98% of the time, in the course of the playing, they end up farther from the place they’re supposed to be than they started. It’s like his head is so full of potential stories that just touching even the most boring toy opens the imagination tap….and 20 minutes later, there we are. No closer to a cleaner living room OR bedtime. So I take the easy way out….and pick them up myself. We survived the early parenting mistake of taking a 3 year old into a toy store to pick out his own toy using birthday money. It seems so obvious now that it was a bad idea….but irrational hope is a mainstay around here. He would pick out one, then another, hold the two side-by-side, look from one to the other, and say ”hmmmm. hmmmm.” Karel has survived multiple moves, lives with two languages, and has to repeatedly say good-bye to loved ones… but I really think that making him choose one toy out of so many was the most traumatic thing he has lived through; the following meltdowns and exchange requests seem to be further evidence. BUT, I was blessed enough to experience one of those glowing, I-have-it-together, these-little-people-are-also-my-friends moments today. We had a breakfast picnic this morning. I had planned this, and packed sandwiches and fruit for us to eat somewhere on our drive back from the airport this morning. Of course, once we were at the airport we realized that that bag hadn’t made it in the car. Neither had the one with my debit card and driver’s license. Which didn’t really matter because it’s Sunday and all the grocery stores are closed anyway, so even if I had money I couldn’t buy anything anyway. Because sometimes it feels like everything is working against you. ANYWAY, Bjørn handed over his cash, the gas station had a passable selection of food and was, more importantly, open, so it was all fine. 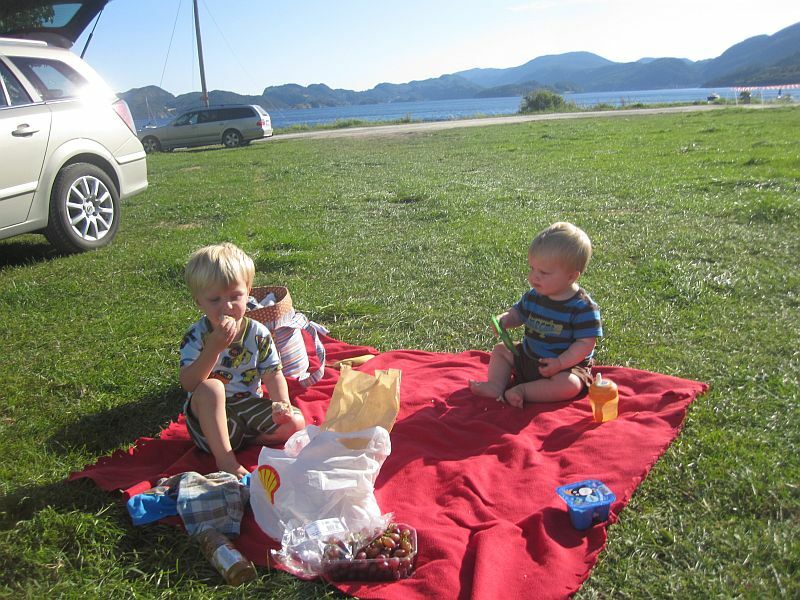 So we took a side road that went down to a camping place by the fjord, and sat on a blanket in the grass on this unusually warm August day eating grapes and sweet rolls with chocolate pieces. 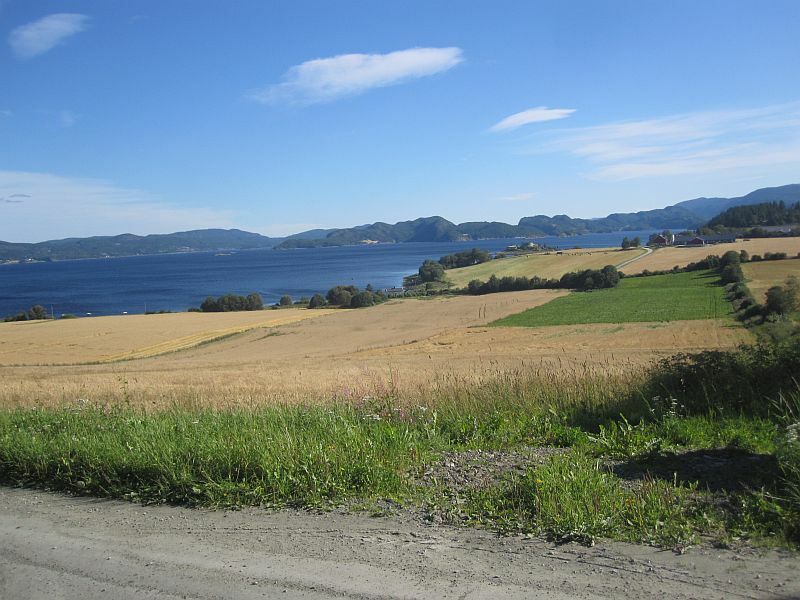 All with the typical stunning view of fields, forest, and rolling hills. Because it all always works out, and that sometime feels like a victory. Our first-born baby is officially, absolutely not a baby anymore. 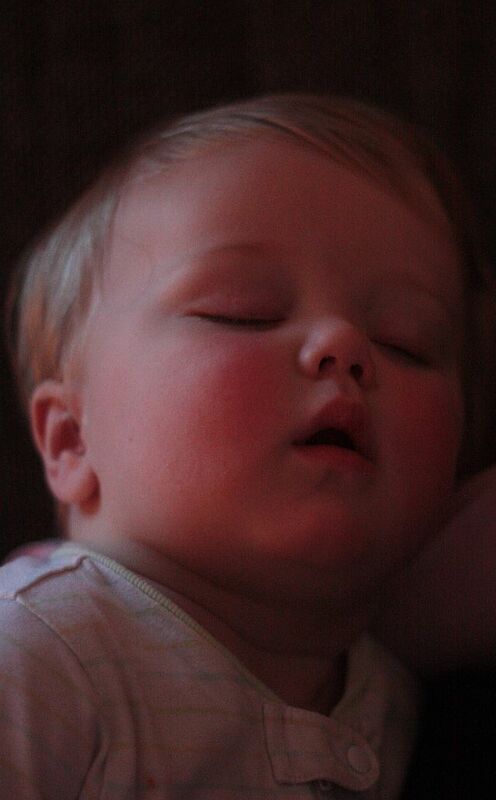 We could still kind of pretend he was while he was 2 or 2 1/2, when there was still a little bit of baby-chunk, or some baby-ish speech, but now…. Now we have a little boy who makes up stories with his toys and jokes with us, who knows all the words to the songs of his favorite shows, and has memorized his favorite books. A little boy who is exploring boundaries and wants to ”do it mysewf”, who won’t always hold our hands, but still needs mama and pappa to kiss owies. I’m going to be honest for a second about this house-wifey world I’m living in lately: It can be tiresome. So that statement is like the complete opposite of a shocker. The whole cleaning/food-making/kid-rearing thing aside, it’s mostly the identity shifts that wear me out after a while. One minute you’re a young and single professional honing your beer palate. Next thing you know you’re driving a Land Cruiser through sub-Saharan Africa. That bit actually goes on a for a while. Then suddenly you’re back where people look and sound like you…but with a husband (who doesn’t exactly sound like you). And then there’s a baby, and yet another role is born. So, so far we have: young partying professional, young international (occasionally partying) professional, young-ish wife, prego-reestablishing professional, MOTHER. 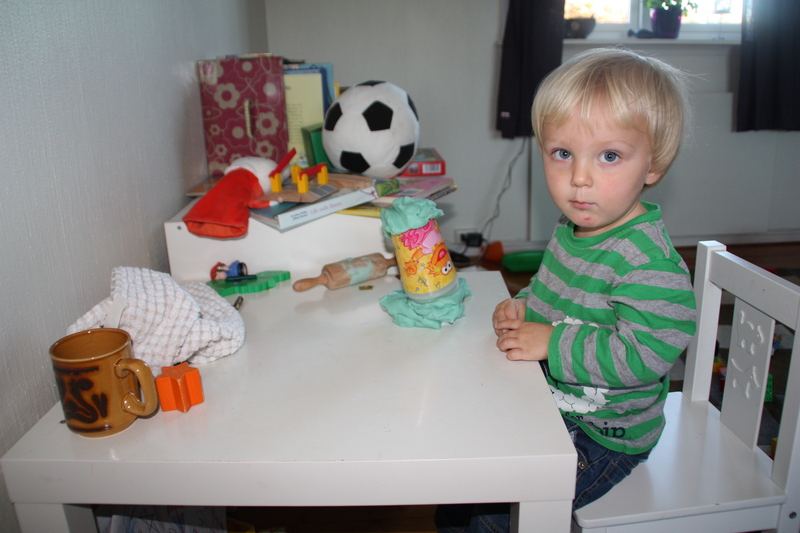 First, we build a play-doh tower (the crayon topper fell down just before this picture was taken).